The solo art exhibition by Kuntal Barai titled ‘Displaced in Dhaka’ has begun at La Galerie, Alliance Française de Dhaka. The Inaugural ceremony of the exhibition was held on Friday. Academic, urbanist and art writer Professor Nazrul Islam graced the occasion as the chief guest. Deputy Head of Mission, Embassy of Italy-Dhaka Giusepee Semenza, Associate professor and chairperson Faculty of Fine Arts, UODA Shahjahan Ahmed Bikash, art critic Mustafa Jaman and eminent artist Munirul Islam also attended the opening ceremony of the exhibition. Kutal Barai, the young artist did his BFA and MFA in the Painting Department of University of Development Alternative. He has attended more than twenty group exhibitions in home and abroad. He was awarded the ‘Honorable Award’ for the 17th Asian Art Biennale by Bangladesh, National Art Gallery, Bangladesh Shilpakala Academy, Dhaka. About the Exhibition: A number of studies state that Dhaka has reached the peak of criticality with its unplanned growth. Overpopulation, traffic congestion, “development” sprees, and insanitary conditions have reached an all-time high. Where for a select few who can bear the brunt of a megalopolis gone haywire, Dhaka is a necessary evil, but the majority of Dhakaites do not find Dhaka a safe haven anymore. The project is a survey of all of these and more. As an artist artist Kuntal Barai’s work takes into account the chaos as well as the sense of loss we have developed over the years. Still the artist believes there is an organic form of life in this chaos through which a new vision may one day burst into view. Therefore, Kuntal’s work neither is a mere depiction of the lived experience nor is it only an interpretation where the real has been dissolved into conventional aesthetic standards. It is in fact a mixture of both. There are about 100 artworks to be despaired in the exhibition and the media he uses are mixed media, printing and acrylic. 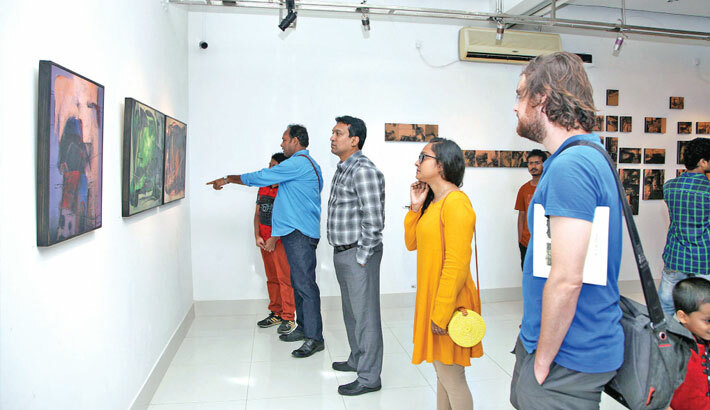 The exhibition will be open to all till May 19 in La Galerie, Alliance Française de Dhaka. Visiting Hours: Monday to Thursday, from 3:00pm to 9:00pm, Friday and Saturday (9:00am to12:00noon and 5:00pm to 8:00pm). Closed -Sunday.